Stratford upon Avon Town Hosts - Making Your Visit to Stratford Perfect! The introduction of Stratford upon Avon's Town Hosts represents the first major investment by the Stratfordward Business Improvement District. There are five of us (you'll see us around the Town Centre between 9am and 7pm, seven days a week) - all working to make Stratford upon Avon the UK's friendliest town! Act as friendly, reliable information guides. Provide a link between shops, businesses and public services. Offer extra support for the security and emergency services. 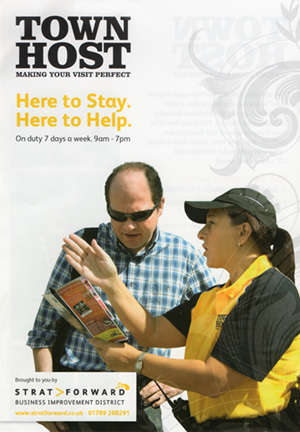 So whether you work in Stratford upon Avon or just visiting, we're here to help. If you're having trouble finding your way around. If you need a taxi. Or even if you can't remember where you parked your car! Just ask a Town Host. If you run a business within the Business Improvement District, you'll be pleased to know that we'll be popping in regularly for a chat and to get your feedback on how you think we can help you with some of the issues your business faces.